Garden Design, Installation, Maintenance, and Coaching. Save money, eat better, and grow your own organic produce with a Love & Carrots Garden. Every new garden starts with an initial site visit and consultation. Our garden expert meets with you at your home to discuss your goals, past gardening experience, and vision for your future garden. We collect all the information we need to create the proposal and estimate for your garden. If requested, we can create a drawn-to-scale graphic to help you visualize your proposal. All of our gardens incorporate herbs, companion plants, nutrient cycling, and best practice for optimizing harvest. We are happy to collaborate with your Landscape Architect. After you agree to our garden estimate, our team of experienced garden builders will make your design a reality. All our installations come with our custom organic soil mix and a planting of organic vegetable transplants and seeds from our greenhouse. Gardens take care and expertise to be successful. Let us take the intimidation out of organic gardening with our Garden Care and Coaching Services. Learn more below. We make sure your garden is as healthy and productive as can be. Enjoy your usual gardening routine without the frustration of falling behind, or just sit back and enjoy the harvest! Our Urban Farmers come every other week while you're at work and provide all your garden needs: seed, thin, prune, trellis, planting plan, fertilize, pest management... we'll even harvest for you and put it in your fridge. Starts at $115/visit, plus materials (rate can vary based on garden size and travel distance). Every 2 weeks, March to November. Garden Care, plus one-on-one garden lessons throughout the season with an assigned Urban Farmer. Our Urban Farmers come at a reserved, regular time to teach you and your family as we go. 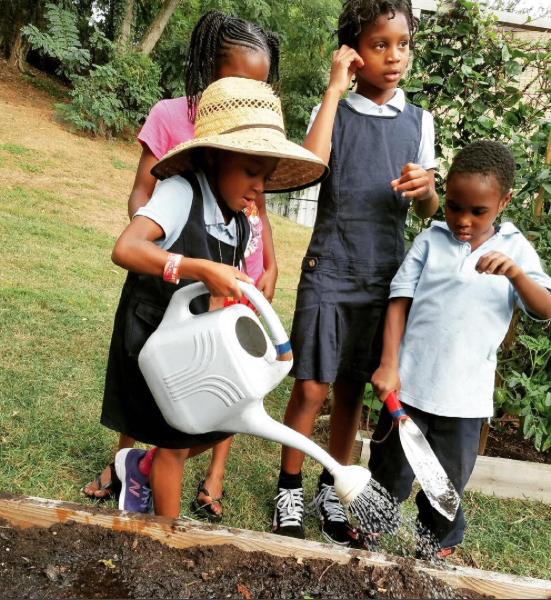 Utilizing our very own garden curriculum, we come equipped with prepared seasonally appropriate lessons - but also ready to tack any garden-specific issues that may arise. Starts at $175/visit, plus materials (rate can vary based on garden size and travel distance). Every 2 weeks, March to November, set day and time.